Price:£ 6.99/yr. VAT 20% inc.
See also original .co.uk, org.uk, .me.uk plan location on their website! A domain name transfer to us is easy, so if you're unhappy with your current web hosting provider or would like to take advantage of our new pricing and outstanding features, transfer your domain name to Zen Internet now. A domain name transfer is at no extra cost to you and you will only be charged the same price as a new domain name registration fee. Use our simple transfer guide below to find out more. When you register a domain name, your personal contact details such as name, address, e-mail address, and telephone number are available in the online, publicly accessible WHOIS database. Domain WHOIS Privacy protects your personal details by hiding your address, e-mail address, and telephone number from public view, it is available on .com .net .org .biz .info domain names and can be ordered online at the same time as registering your domain name. Domain WHOIS Privacy is only £4.99 ex. VAT per year. 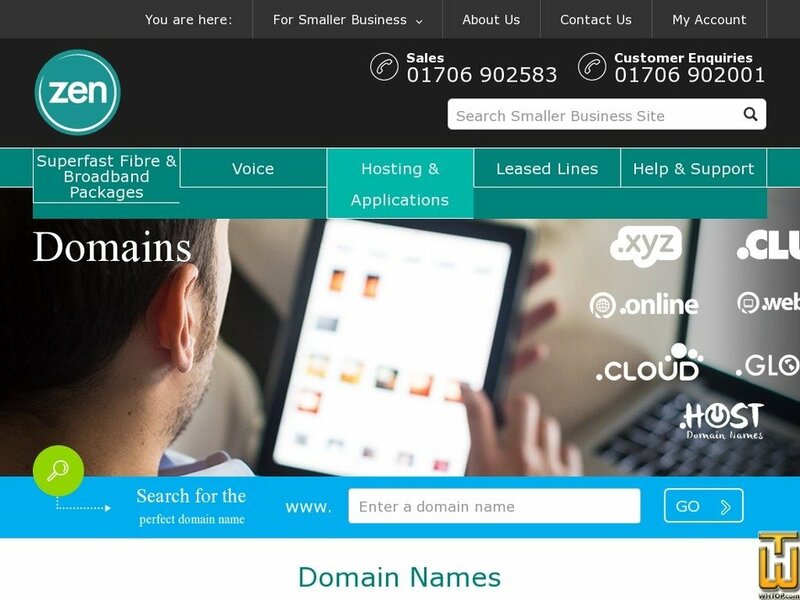 If you register a lot of domain names, you can take advantage of our fantastic rates on bulk domain name registration. Best of all, our bulk domain name registration discounts are cumulative so you don't need to transfer or register all your domain names at once to benefit from an improved price. Every domain name you register with Zen will count towards your total and be discounted. Price: £ 6.99/yr. VAT 20% exc. Price: £ 7.49/yr. VAT 20% exc. Price: £ 8.74/yr. VAT 20% exc. The price you see for a domain name is the price you'll pay, we don't add extra fees or costs.